A 30-year-old manchild waves his arms around to play a 35-year-old game. Gesture-based gaming ain't new, but using it to steer Pac-man around a maze is. Moff band, a Japanese gesture toy for kids, has teamed up with Namco-Bandai to bring gesture controls to smart device-based versions of Pac-man. Because it can. It's part of what Moff calls "gamified fitness technology" (you really have to wave your arms around to move the protagonist), but it's also silly and often a little erratic. 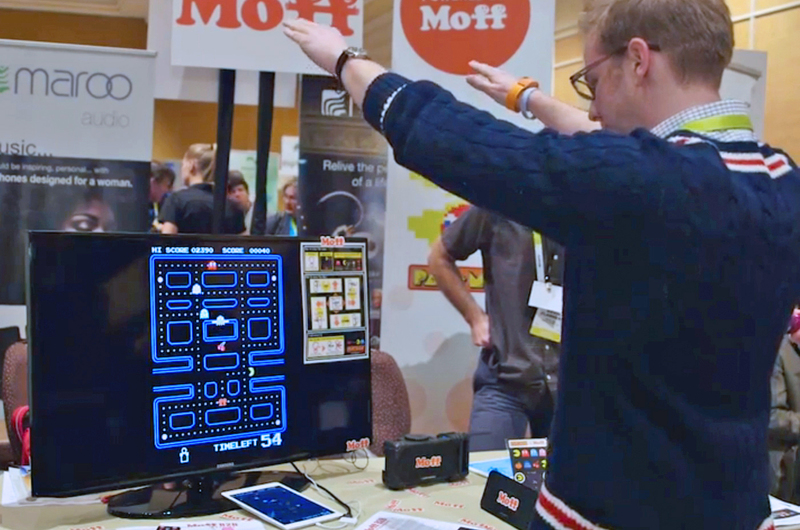 In Moff's defense, a Bluetooth-connected controller will have troubles in a hectic show floor demo. Watch me embarrass myself for your entertainment after the break. I'm saying it was definitely a reception issue. The Moff band is already on sale on Amazon for $55, while both the wearable's app and the PBS Kids Party App are also available on iTunes, Google Play and Amazon.